The Serbian world number one neutralized Frenchman Jeremy Chardy with a 6-3 6-2 6-2 victory in 86 minutes and, like Murray, has now won all nine sets he has played. American Serena Williams, bidding to equal Roger Federer's 17 grand slam titles by successfully defending her crown, has also been blemish-free and offered no concessions to 42-year-old Kimiko Date-Krumm under the Centre Court roof. The women's top seed was scheduled last on Court One but with other matches dragging on she was switched across to Centre where she dispatched the Japanese veteran 6-2 6-0 in an hour. While Djokovic and Murray have been in perfect harmony, elsewhere the opening week has been a turbulent one with a head-spinning spate of shocks, injuries and withdrawals. Surprises were thinner on the ground on Day Six with men's fourth seed David Ferrer coming closest to falling through the trapdoor before battling back to beat unorthodox Ukrainian Alexandr Dolgopolov in five sets to reach the fourth round. The 31-year-old was joined there by 2010 runner-up Tomas Berdych, the Czech seventh seed, who beat giant South African Kevin Anderson for the ninth time in a row, and Argentine number eight seed Juan Martin del Potro who survived a collision with a court-side chair to overpower Slovenian Grega Zemlja. As in the men's draw, only six of the top 16 women have reached Monday's fourth round which will feature a total of nine players aged 30 or over - equaling a professional era record at Wimbledon. Australian 14th seed Samantha Stosur was the main casualty in the women's singles on Saturday, losing to Germany's Sabine Lisicki, but there was better news for fellow Australian Bernard Tomic as the 20-year-old continued to shake-off his bad-boy image by knocking out dashing French ninth seed Richard Gasquet. Japan's Kei Nishikori also fell short, the 12th seed losing a long match to Italy's Andreas Seppi who has now won his last seven matches that have gone the five-set distance. Women's fourth seed Agnieszka Radwanska of Poland, last year's runner-up, ended the run of American teenager Madison Keys in a hard-fought three-setter, while sixth-seeded Chinese Li Na and former champion Petra Kvitova, the Czech eighth seed, remained in contention after also being taken the distance. The queue at the medical room has shrunk since Wipeout Wednesday when seven players withdrew or retired but Dutchman Igor Sijsling quit mid-match against Ivan Dodig on Saturday to take the total to a tournament record-equaling 13. Croatia's Dodig, who is up against Ferrer next, has reached the fourth round despite finishing only one match. 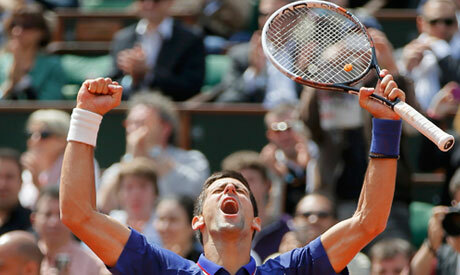 Djokovic was the definition of efficiency against Chardy, who he had never dropped a set to in six previous meetings. The 26-year-old Serb made only three unforced errors and crunched surgical winners for fun in a sobering display for British fans dreaming of Murray holding the trophy aloft next Sunday. Djokovic, desperate to make up for an epic French Open semi-final defeat to Rafa Nadal by claiming a second Wimbledon title, has yet to lose a service game in the tournament and has leaked a mere 29 games - two fewer than Murray. If he needed to issue a statement of intent to counter the home hysteria, which went up a notch on Saturday when British teenager Laura Robson also reached the last 16, Djokovic did it. "It was a fantastic match. I felt great from the start until the end," the six-times grand slam champion, who faces 13th-seeded German veteran Tommy Haas next, told a news conference. "I enjoyed every moment of it. When you play that well you feel great, you feel confident. "This kind of performance came at the right time for me. I'm going to expect tough challenges in front of me but I'm ready." With Murray enjoying a day of leisure - apart from a brief appearance on Centre Court as part of a celebration of some of Britain's Olympians from London 2012 - Robson kept the home pot bubbling when she came back from the brink to beat New Zealander Marina Erakovic, prompting resounding cheers around the grounds. Robson, a former junior champion, won 1-6 7-5 6-3 to become the first British woman to reach the fourth round for 15 years. Victory over unseeded Estonian Kaia Kanepi would put her on collision course with five-times champion Williams who stretched her winning streak to 34 when demolishing Date-Krumm. Williams walked on court stoney-faced and said she had been slightly puzzled by the scheduling. "I was a little surprised I was playing third after two men's matches," the 31-year-old, who has dropped only 11 games to reach the fourth round, said. Her patience was rewarded with her first night outing under the Wimbledon roof which slid shut to allow its lighting system to illuminate her latest dazzling display. "I love the atmosphere. I love the sound that the ball makes," she said. "It just feels really cool." With Wimbledon sticking to its tradition of having no play on the middle Sunday, Monday promises to be hectic with a total of 16 men's and women's singles matches across the courts. Murray will take center stage when he takes on Russian 20th seed Mikhail Youznhy for a place in the quarter-finals. Youzhny loomed onto the Scott's radar with a straightforward victory over Serbia's Viktor Troicki and afterwards shrugged off the prospect of facing a home favorite in his own backyard. "Don't worry, I will sleep normal," he said.